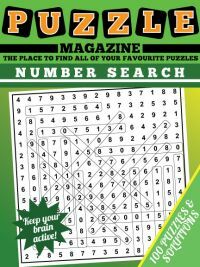 Hypersudoku can be seen to the right of this page. 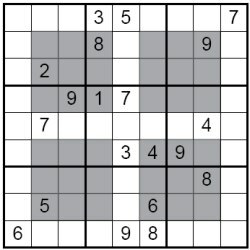 You'll see that it looks quite similar to ordinary sudoku, except for the fact that there are four grey boxes in the puzzle grid. 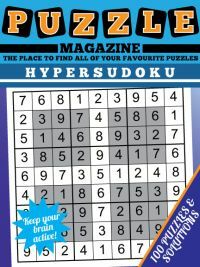 Hypersudoku is a class of extra-regions sudoku puzzles (such as Sudoku X which has two extra regions, in that case the major diagonals); infact hypersudoku is sometimes referred to simply as extra regions sudoku and occasionally windoku or quad-doku based on the visual look of the puzzle. The grey boxes represent additional 3x3 regions in the grid, so overall the puzzle contains 31 regions compared to the usual. 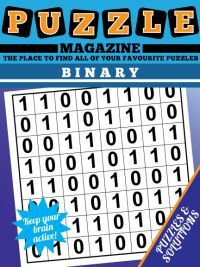 The key to solving these puzzles successfully is to remember that these additional boxes must also contain 1 - 9 once only, and using the information that provides to help solve the puzzles successfully. 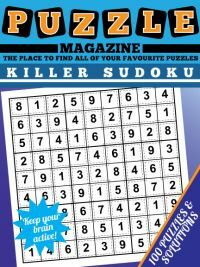 This collection contains 100 all-new Hyper Sudoku puzzles, principally of medium difficulty, though difficulty will vary to some extent from puzzle to puzzle. 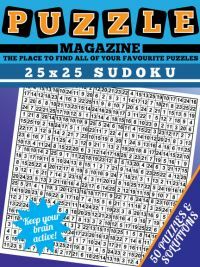 The PDF download contains 25 pages of puzzles at 4 a page, then 25 pages of solutions at 4 a page on A4 sized paper. 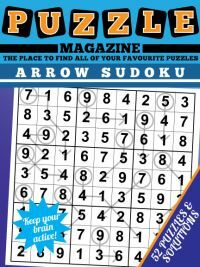 You can see a sample of the first page of HyperSudoku Magazine before deciding whether to buy.